Frederik Pohl’s Gateway is one of my all-time favorite sci-fi stories, and so I snagged another one of his books as I was browsing through the library. 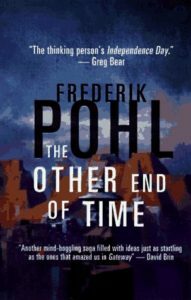 The Other End of Time is the first book of the Eschaton trilogy, and I have to say that while the series may be good (haven’t read it, yet), the first book felt incomplete and disappointing. A pet peeve I have in comics and in modern books is that stories are incomplete. I sort of enjoy recurring characters, although I prefer to use my own imagination to determine how things went after a story is finished. What I don’t enjoy is investing hours in a novel without getting a true beginning, middle, and end. This one felt broken up without a satisfying structural resolution. I’d recommend reading Gateway instead, which is the first book in a series but stands alone. What I did like about this book was the world. It centers around a guy in our near future who is some sort of shadowy spy/corporate espionage player. His version of M sends him into a relative’s Space X-like company for reasons that quickly become apparent. The company is heading to figure out why they lost contact with a ship in orbit around Earth. We head into orbit with our protagonist, and, as the title suggests, find much more than we expected. The book was published in 1997, but the ideas about privatized space exploration and research feel pretty fresh. Time-bendy stuff is also always cool. If you don’t mind tracking down all three books, this could be a fun series, if not a great series. Share the post "An incomplete yet intriguing start to a series"
Happy Cannonball! Sorry it was on a bummer of a book. Happy Cannonball! Too bad it wasn’t As You Wish which you enjoyed so much more.